They win 3-0. Aïssa Tounkara slotted home in the 3rd minute from an early corner. Ángela Sosa doubled the lead on minute 22 after a good cut back on the left from Andrea Falcon. Some strong chances followed by Ludmila and Jenni Hermoso, but they had to settle for a 2-0 lead. 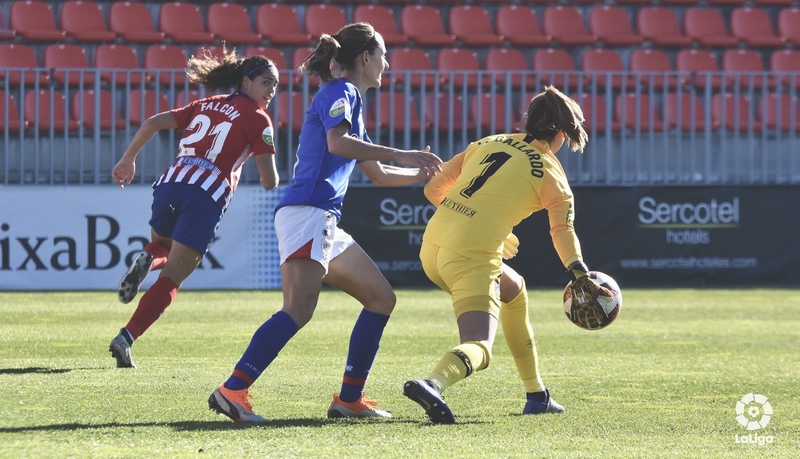 In the second half, Atléti had been finding it harder to pass out from the back and were often under a lot of pressure until Sosa nearly took her tally to two for the match. 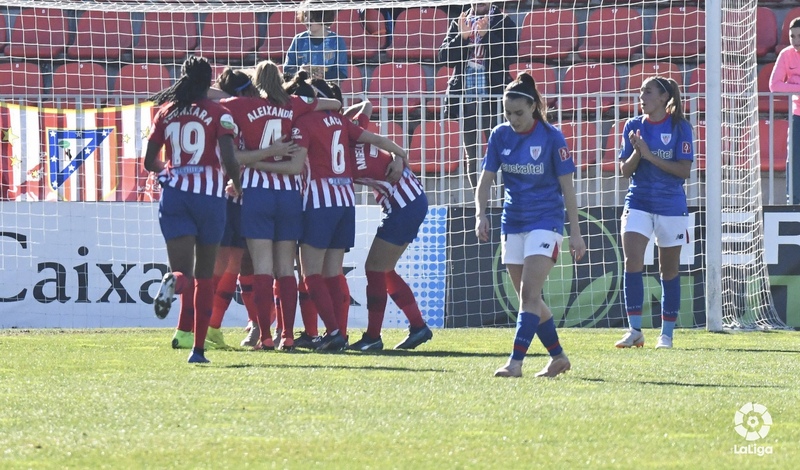 In a very similar move to the second goal, another cut back from Falcon finds Sosa but her shot was deflected into the goal by the opposition’s goalkeeper Ainhoa in the 85th. Bilbao just couldn’t find the target and Atlético come away with the 3 points. This is the 15th game they’ve won, and they’ve lost just 1. Scored 55 goals and conceded 11. They’re into the next round of the Queen’s Cup too. Most of the outfield players have got a goal, but Ludmila da Silva is in front with 7 in the league and 4 in the cup. There are sixteen teams in the league and Barcelona are 4 points behind with a game in hand (at the time of writing). They are the main threat, and it will come down to the return game of Atléti – Barça in March to see who will get the league this year. 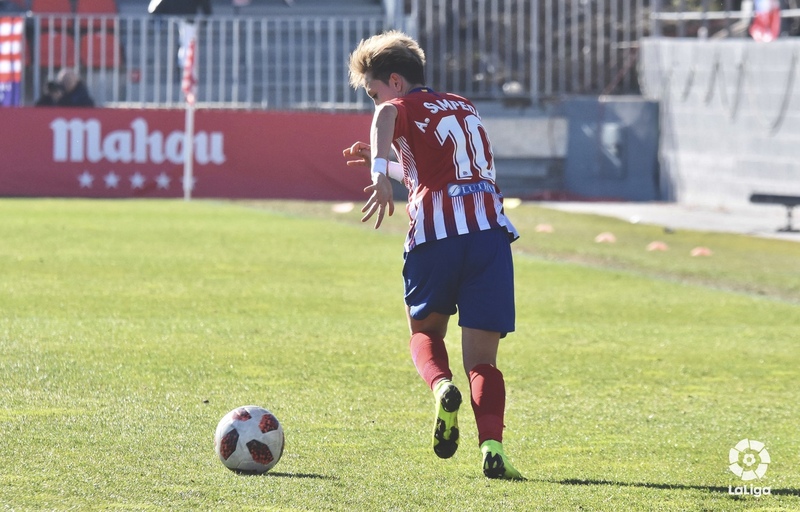 Atlético de Madrid: Lola Gallardo; Kenti Robles (Viola Calligaris, 63), Tounkara, Laia Aleixandri, Falcon; Kaci, Meseguer; Amanda Sampedro (Olga García, 66), Jenni Hermoso (Esther, 77), Ángela Sosa (Anita Marcos, 86); and Ludmila. Athletic Club: Ainhoa ​​Tirapu; Andrea Sierra (Oihane, 58), Vanesa Gimbert, Ainhoa ​​Álvarez, Eunate; Moraza, Marta Unzué, Damaris, Cirauqui (Marta, 86); Nekane (Leia, 74) and Jone Ibáñez (Azkona, 68).